This Camp is designed for players and goalies of all ages. If you want to score you have to shoot the puck and shoot it a lot. That is exactly what we will be focusing on in this camp. Players will be shooting pucks on the ice as well as off the ice. Coaches will instruct on proper technique to maximize the players power and accuracy. Goalie is the most specialized position in hockey. Our goalie coach we be with the goalies improving technique, quickness, and helping with all aspects of this unique position. Young players need to work on fundamentals and skills in a fun learning environment. Skating being the most important. The skating that will be covered will work on edges, skating stride backward and forward, crossover, stopping, turning, quicker starts, and transitioning. Controlling the puck at high speeds is a skill the every kid needs to develop. Through a series of drills and games players will improve on stick-handling, passing, shooting, and basic puck control. After the skills are improved the staff will show how to use the skills in game situations within small area games and hockey specific drills. High Intensity will be the focus of this camp. On a daily basis players will be put through drills focusing on speed and skill. Hockey concepts such as angling and body checking will be taught throughout the camp using drills as well as small area games. Players will be expected to work hard and have fun. This camp is designed for hockey players that have 0-3 years experience playing. Players will be grouped by age and or skill level with drills being designed for the specific groups. Skating is the basis of hockey and will be the main focus of this camp. 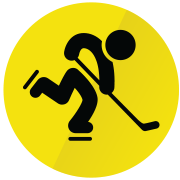 Through the use of full ice games (Tic-tac-toe, capture the flag etc..) players will have fun while improving their skating and puck control skills. As the season approaches The Pond offers one more week of camp for players of all ages. Power Skating week will have a heavy focus on technique, power, quickness, and conditioning. Players will be grouped by age to help create a more practice like environment. This camp has maximum number of 40 skaters.